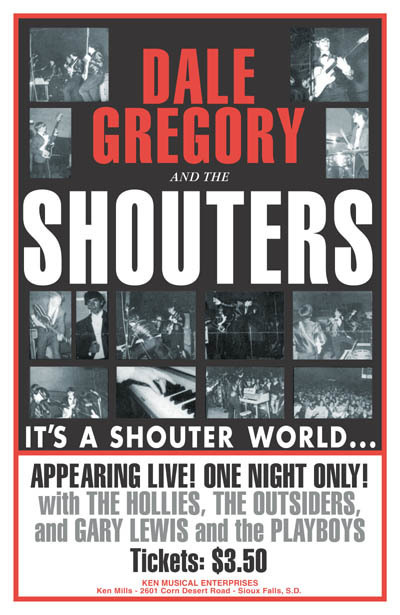 In the mid sixties Sioux Falls was home to many teen bands but one of the most popular was Dale Gregory and the Shouters. In the summer of 1964 Washington High students Dale Gregory Yost (lead guitar), Gary Tabbert (bass), Ted Christy (drums), and Dave Hauck (rhythm guitar) formed a group called Troy Shondell & the Bahamas. Dave was soon replaced by Greg Blomberg (vocals) and the band also added Pat O'Brien (vocals, piano, organ, keyboard). The group quickly changed their name to Dale Gregory and the Shouters. High school buddy and 2009 HOF inductee Ken Mills became their booking agent and within a year the multi talented Mills had them playing at ballrooms, clubs, and other places in states all across the upper Midwest. This included the Sioux Falls Coliseum Annex, where they would usually draw offer 1,000 loyal fans. In 1965 Ken Mills arranged for the Shouters to record at Dove Studio in Minneapolis. Nothing materialized from the recording so they decided not to release a single. But later that summer the Shouters headlined the Teensville Ramp Dance in downtown Sioux Falls before 10,000 people. Their popularity seemed to be growing even more. In early 1966 the Shouters returned to Dove Studio to record "Did Ya Need to Know', written and sung by Greg with the flip side titled "I Remember", written and sung by Pat. 1,000 copies were pressed and released on the B-Sharp label and it became a #1 local hit on KELO radio. Success followed as they performed on local television, battle of the bands, and many other Midwest venues. In the fall of 1966 Gary Tabbert left to attend college while Ted Christy and Pat O'Brien joined the group "Those of Us". Roger Opheim was added on bass and Mike Titus on drums. They continued to play into 1968 but then the band slowly dissolved. Anyone who was a teenager in the Sioux Falls area in the mid sixties has memories of one of the best and most popular bands i the area.